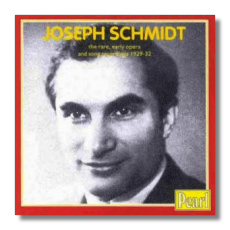 Few tenors sang with the mixture of pathos and melting beauty that seemed to come naturally to Joseph Schmidt. He was born in 1904, the third son of poor parents, in a small Romanian village, and he developed an immediate attraction to music. By the time he was 20, it was clear even to his reluctant father that singing would be his life's work, and he was sent to study in Berlin. After a short period of military service, he made his official debut in 1929, and he became hotly in demand as a radio singer and recording artist. These mediums suited him well, because Schmidt was only about five feet tall. Staged operatic performances therefore were relatively uncommon for him, although in Brussels he made dozens of appearances as Rodolfo in La bohème, reminding one critic of a teddy bear. Clever use of the camera also allowed him to appear in ten films. As dark clouds gathered over Europe, Schmidt, a Jew, found himself increasingly subject to the era's cruelties. A series of unfortunate circumstances led to his arrest in Switzerland as an illegal refugee. His health finally broke, and he died, more or less a prisoner, in 1942 - an ignominious fate for someone who made so many musical promises, and who would have kept even more of them had he lived. This collection contains recordings that Schmidt made for the Electrola and Ultraphon labels between the years 1929 and 1932. About half of the repertoire is operatic, and there also are songs (mostly of the Neapolitan variety) and excerpts from operettas. Almost everything is sung in German, emphasizing the fact that Schmidt was a popular singer, in the very best sense of the word. He was a mature singing artist from his very first recordings. He used his beautiful and velvety voice with discretion, and he treated his surprising reserves of power with respect. Even when he was singing the music of Verdi or Puccini in German, Schmidt was Italianate, but he could shift gears and be an idiomatic performer of Lehár's music as well. It is impossible to exaggerate the seductive powers of his voice. Perhaps it is his unlucky life that clouds my artistic judgment, but I mention Schmidt in the same breath as Björling, Martinelli, Lauri-Volpi, and Gigli. It is no wonder that he was called "the pocket Caruso." His 1930 recording of O sole mio drips with suave and personable vocalism, and the Act III duet from Tosca (with soprano Gösta Ljungberg) demonstrates his aptitude for singing with meaning, rather than simply making pretty sounds. This collection is excellently produced by David Lennick, who also did the transfers. The 78-rpm discs don't hide the voice's virtues one bit. An essay by Arthur Zimmerman fleshes out the facts behind Schmidt's life, which seems to call out for cinematic treatment. Because his vocal legacy has been inconsistently represented on CD, don't miss this set; it contains some of the "tallest" singing you'll ever hear from a tenor.